Doug and I have tickets to a show by Andre Kole tonight. Andrea Kole is a master illusionist and my friend, Kathy, who has been to one of his shows says Andre Kole is really, really good. I think I believe her because if David Copperfield calls him "one of the greatest illusionists in the world today" then he must be really good! I have seen some TV specials of David Copperfield, but I had never heard of Andre Kole before this. I think David Copperfield is a great illusionist, and if David Copperfield uses devices created by Andre Kole in his shows than I guess Andre Kole must be really good. What I find intriguing is that Andre Kole is not only a great illusionist but also a committed Christian. The show Doug and I are attending tonight is sponsored by my church. It seems that Andre Kole is also a public speaker for Campus Crusades International. 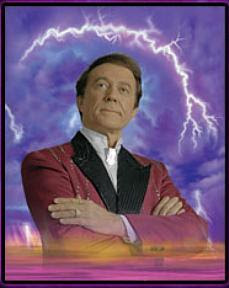 In my books, that makes Andre Kole a greater illusionist than David Copperfield! The show tonight is part of my church's outreach program. Tickets only cost $5 each and at such a bargain we are encouraged to invite our friends and neighbours to the show. Doug and I have not invited anybody. :-( Our church has also provided child care for children up to 4 years old. We are grateful for that because our regular baby sitter will be at the show herself. Ya, it was a really good show despite being held in a high school gym! Really good!